Oops! Cyan was Animating last year! 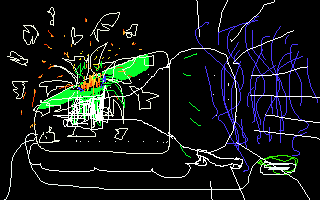 He Set the Pencil Tester up And draw the animation unfolds! Ivo Industries' new product has been causing quite a...uh...bubbling mass of lava lately. Read about this incredible piece of engineering in the product brochure, presented here! Note: Ivo Industries' are not yet accepting orders, and request that you do not bother them for more information. When asked why, a "rrrAAaaAAaa" sound was heard at the other end of the phone, followed by what appeared to be a very violent explosion. We can only speculate. Note to our Mac readership: Ha!